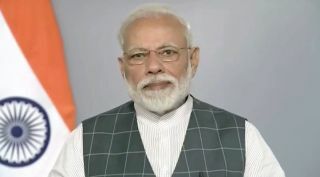 Indian Prime Minister Narendra Modi said that the country's military successfully demonstrated an anti-satellite (ASAT) weapon in a test known as "Mission Shakti." In that test, a ground-based missile, a version of an existing ballistic missile interceptor, hit a satellite at an altitude of about 300 kilometers. "It shows the remarkable dexterity of India's outstanding scientists and the success of our space programme," Modi said in a series of tweets announcing the test. Modi also made a televised announcement, in Hindi, about the test. According to a statement from India's Ministry of External Affairs, the missile was launched from the Dr. A P J Abdul Kalam Island launch complex in the northeast part of the country. The missile struck an unidentified Indian satellite. "The test was fully successful and achieved all parameters as per plans," the ministry stated. The ministry said in its statement that the test was designed to minimize long-lived debris. "The test was done in the lower atmosphere to ensure that there is no space debris. Whatever debris that is generated will decay and fall back onto the earth within weeks." It wasn't immediately known how much debris the test generated, but some debris may end up in higher orbits with longer decay times. The test makes India the fourth country, after the United States, Russia and China, to test an ASAT weapon. Modi and his government said that the test both demonstrated the capabilities of India's overall space program as well as showed its willingness to defend its satellites against attacks. "India stands tall as a space power!" Modi declared. "It will make India stronger, even more secure and will further peace and harmony."